This is a new feature coming to Gmail for Android and it allows users to unsent a sent message. 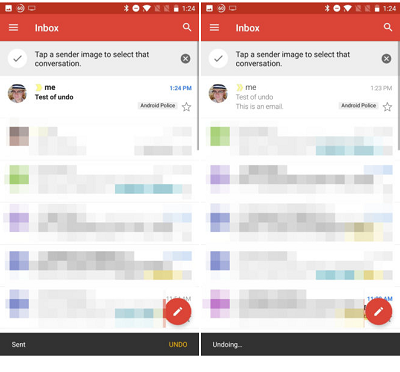 The new feature which is already rolling out according to AndroidPolice allows Android users with the Gmail app to undo sent mails for a short time after clicking send. The feature aims to help users who notice mistakes or missing attachments in their emails. Undo Send allows emails sent to other Gmail addresses to be rolled back for a predetermined amount of time, after which they are permanently sent. Mails sent to external addresses can optionally see a short delay if the feature is enabled, allowing users to retract their mail. The Undo Send feature is reportedly only available in version 8.7 or newer of the Android Gmail app. How Do I Get It (Gmail for Android)? If its not active on your Gmail for android app, simply download the latest version 8.7 from apkmirror. its been long I saw an update from gmail. nice one. Bro I remove cap for u oooo. Only for android? Nice update it will be..